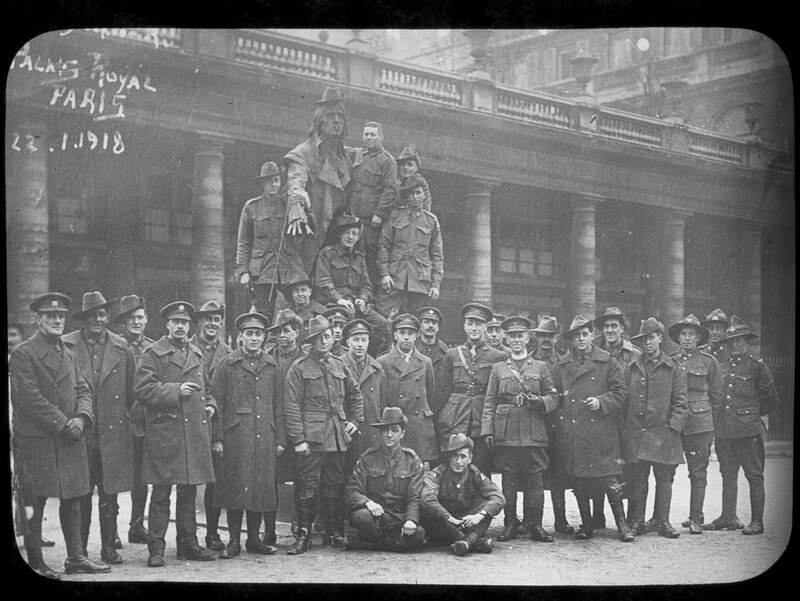 We are delighted to publish some of the personal photographs that have been submitted by relatives and families of soldiers that served in the Australian Imperial Force during the First World War. Acknowledgement and thanks go to the these families. Also have a browse through the Family Stories section for more photographs and items within the personal collections. The above photograph of 22nd Battalion veterans at an Anzac Day parade was probably taken in the 1930’s. Do you recognise anyone? Photograph courtesy of Jennie Marshall and her grandfather Lieut. LW Harricks. 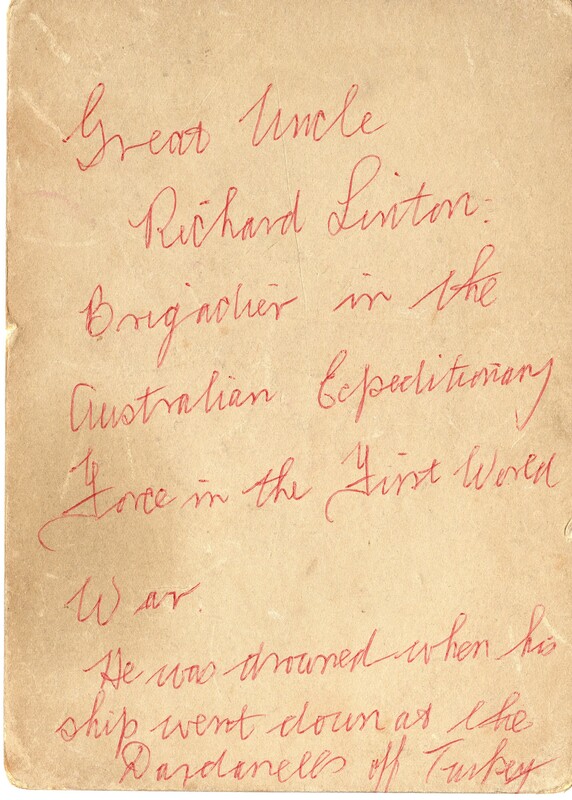 Commanding Officer of the 6th Brigade, Colonel Richard Linton drowned on the 2nd September 1915 during the torpedoing of the ‘Southland’ en-route from Egypt to Lemnos as the AIF 2nd Division prepared to land at Gallipoli. Photograph courtesy of David Smith and the Linton family. Two photographs believed to be of Lieut John Lancey Tallyn who sailed with the 3rd Reinforcements. Lieut. Tallyn served in Gallipoli but suffered from ill health and was eventually repatriated back to Australia in 1917 with bronchitis. Photographs courtesy of Roberta Colbran. Fascinating photograph (above left) of the original burial plot and cross for 2nd Lieut. 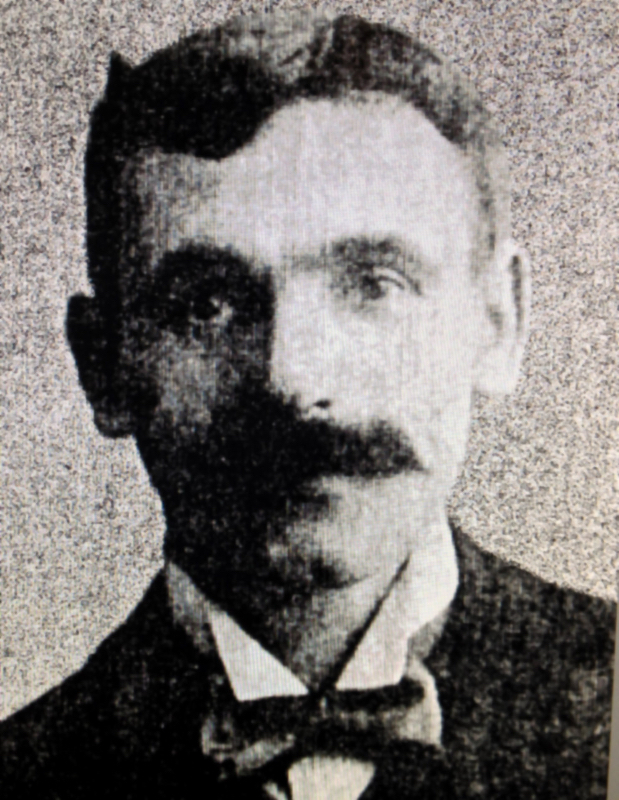 Alfred Lindsay Newland who sailed with the 22nd Battalion (service number 656) on the Ulysses in May 1915. 2nd Lieut. Newland (above centre) killed in action on the 8th November 1916 at Flers while serving with the 6th Machine Gun Corps. 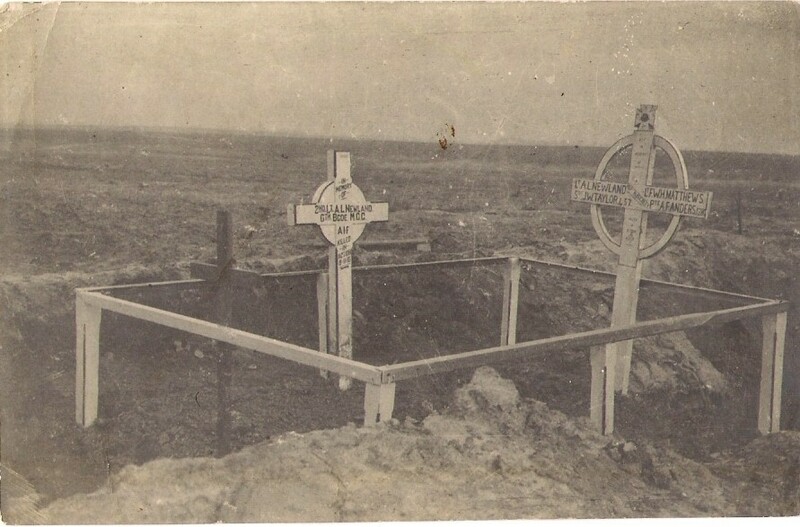 The third photograph is of his final resting place in the AIF Burial Ground, Flers. 2nd Lieut. Newland had a brother Capt. James Ernest Newland of the 12th Battalion who was awarded the Victoria Cross during the assault on the German outpost villages in front of the Hindenburg Line in April 1917. Capt. Newland was later wounded at Bullecourt in May and returned to Australia in July 1917. 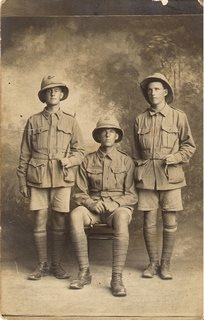 Also on the left is a portrait photograph of the three good friends from Laverton, Victoria, 675 Pte EW Peacock, with 656 Pte AL Newland & 583 Pte WD Cameron, who signed up together on the same day and initially served with the 22nd Battalion in ‘C’ Company. Photographs courtesy of Rob Newland. 182 2nd Cpl Edgar Norman Knell, 22nd Battalion, was the last member of the 22nd Battalion to die overseas having died of illness on 15th January 1920 at Harefield, London. Read Cpl Knell’s story and view more photographs from the family collection by clicking on his name above. Photograph courtesy of Diane Thompson and Ray Harrop. 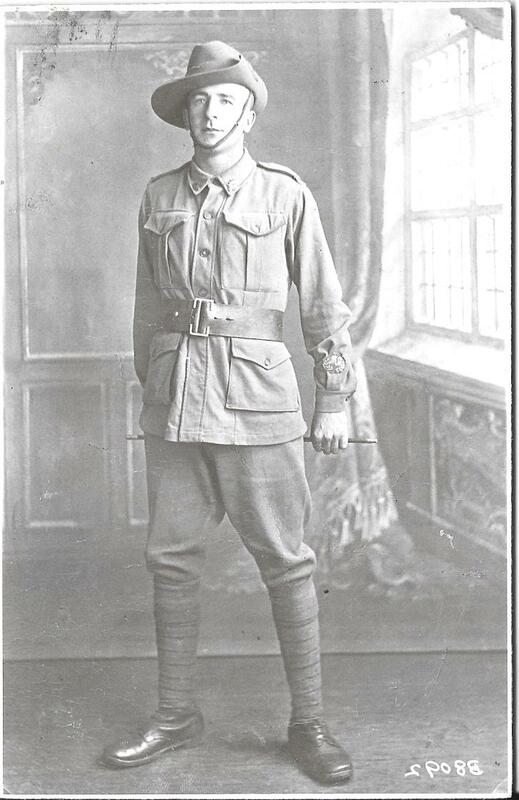 377 Sgt Godfrey David Albert Gallagher, 22nd Battalion, born in Mildura, died of wounds on 11th August 1916 following the fighting at Pozieres in which he was awarded the Military Medal. Photograph courtesy of Keith Almond. 763 Pte Charles Mance, 22nd Battalion born Stratford Victoria. 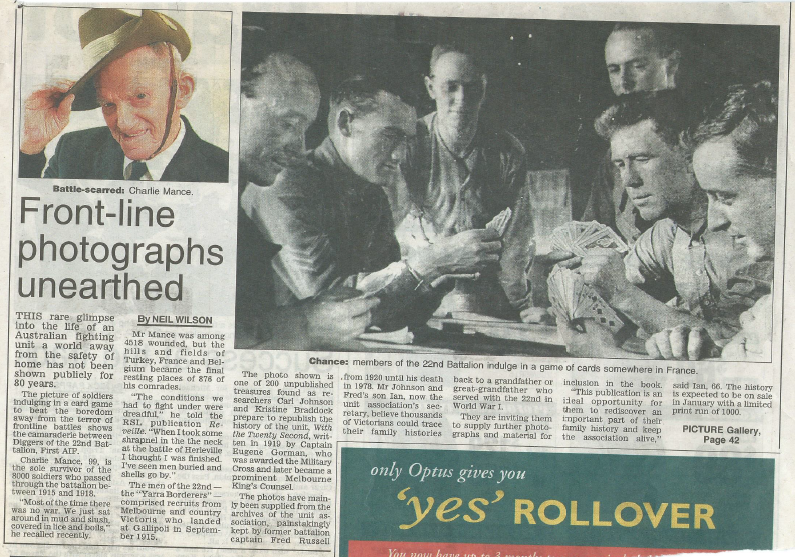 A newspaper interview with Charles at the age of 99, reputedly the sole survivor at that time of the 8,000 men that served with the Battalion. The photograph shows members of the 22nd Battalion relaxing playing cards. Article courtesy of Chris Richardson. 939 Pte Arthur Ernest Watts, in the back row third from the left, pictured with his platoon, 22nd Infantry Battalion. It was probably taken in France in 1917. Note that when Pte Watts enlisted he was assigned to ‘D’ Company. Photograph courtesy of Greg Manderson and Lenore Frost. 985 Pte Hugh Evans, 22nd Battalion, from Mansfield Victoria enlisted 18th March 1915 but died of wounds on 7th August 1916 sustained during the fighting at Pozieres. Pte Evans was a cousin to Capt DG Evans, formerly of the 22nd Battalion, who also died of wounds on 20th September 1917 while with the 8th Battalion during the Third Ypres offensive. Further images can be found on RSL Virtual War Memorial website, courtesy of the Evans family. 1697 Pte John James Lupton, 2nd Reinforcements 22nd Battalion. 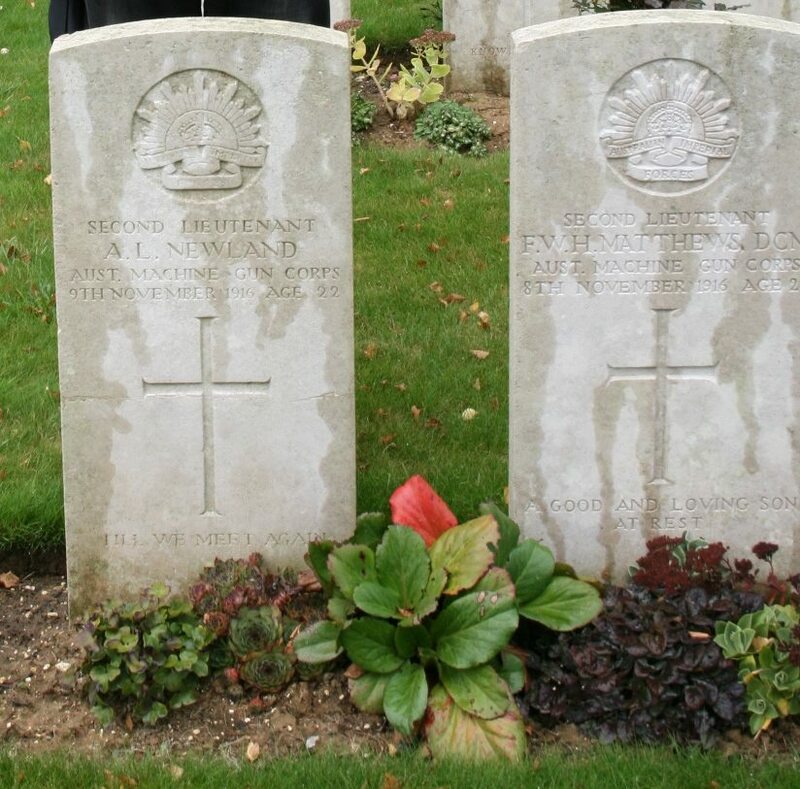 Born in England, Pte Lupton lived in Albert Park Melbourne when he enlisted at the age of 20. During his time in the AIF Pte Lupton had some medical problems with rheumatism and jaundice as well as being wounded in action on 15th Nov 1916 at Flers during the latter stages of the Battle of the Somme. Pte Lupton was transferred to the 21st Battalion then later to the Army Medical Corps where he served in England at the 1st ADH, Bulford, before returning to Australia in 1919. Also believed to be in this photograph is his brother 6370 Gunner William Lupton served in the Australian Field Artillery. Photograph courtesy of Sandra Bullock and family. 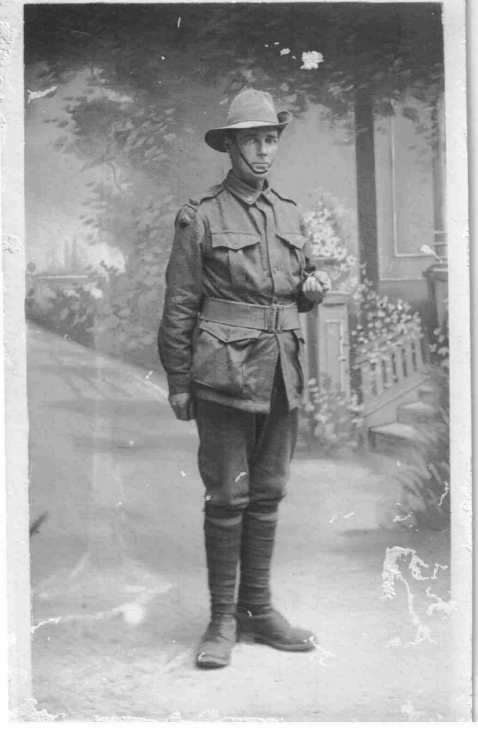 2012 Pte Albert White, MM, enlisted in July 1915 with the 3rd Reinforcements 23rd Battalion, but having served in Gallipoli was transferred to the 22nd Battalion in March 1916 as the AIF sailed for France. Pte White was wounded in action on the 3rd October 1918 during the attack at Beaurevoir in which he was awarded the Military Medal. Pte White died of his wounds a week later in hospital in Rouen, and in so doing was the last man of the Twenty-Second to lose his life through enemy action during the Great War. Pte White was also a cousin to Major LW Mathews of the 22nd Battalion. Photograph and other memorabilia courtesy of the Ballarat Clarendon College and placed on line by the Victorian Collections. 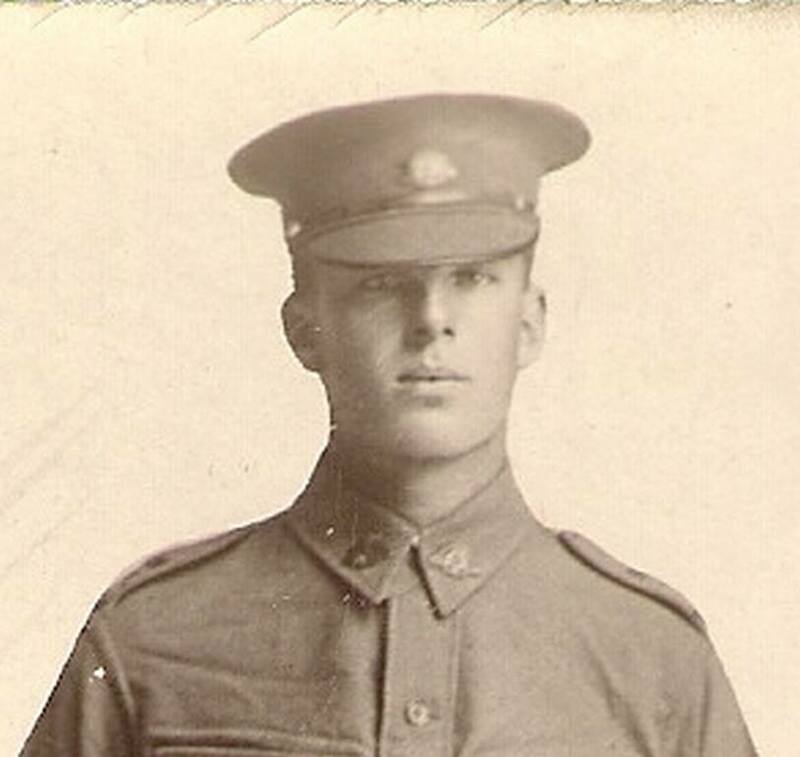 2445 Pte Arthur Wells, 5th Reinforcements 22nd Battalion, AIF, Died of Wounds at Puchevillers on 30th July 1916 following his wounding at Pozieres two days earlier. Photograph courtesy of Jill Kerr and family. 2491 Sgt Leonard Walter Garner, 5th Reinforcements of the 22nd Battalion. 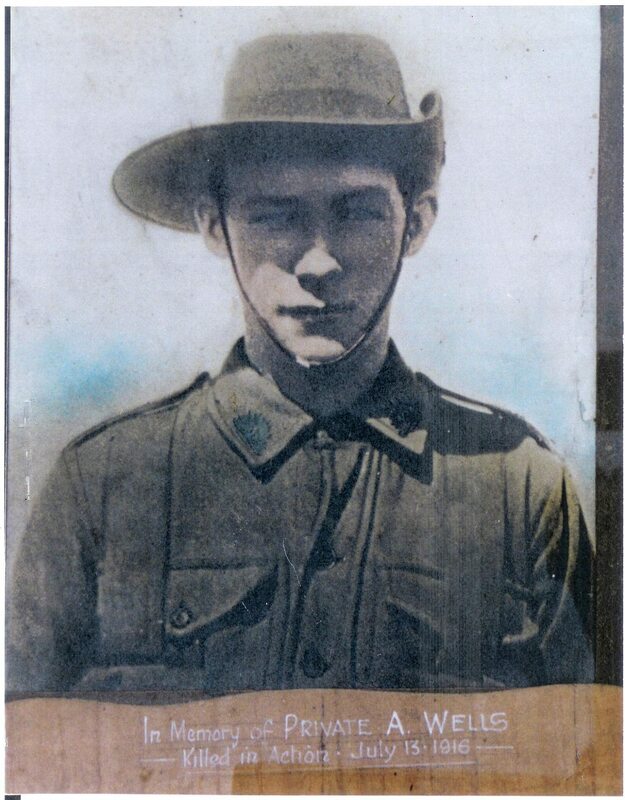 As Lance Corporal, Garner served with the 22nd infantry battalion in France and Belgium through 1916 including Bois Grenier, Pozieres and Flers, until he was transferred with promotion to the 1st Salvage Corps on January 1917 with whom he remained for the duration of the war, returning to Australia in April 1919 on the HMAT ‘Sardinia’. During his time in France and Belgium Sgt Garner collected a number of varied memorabilia, including photographs taken on the return voyage, that his grandson Chris Richardson has kindly provided for this collection section of the project website. 2953 Gunner Albert Edward Strandgard, 5th Machine Gun Battalion, formerly of ‘D’Company 22nd Battalion. Gnr Strandgard enlisted August 1914 and returned to Australia in July 1919. Photograph courtesy of Barbara Strandgard and family. 4132 Pte Gilbert Thomas Heyme, 10th Reinforcements / 22nd Battalion, killed in action 5th August 1916. Article and picture in the Daily Advertiser looking for relatives of Pte G. Heyme, Pte James Heyme or Driver G. Burkett. Click on the link to see the article in the newspaper. 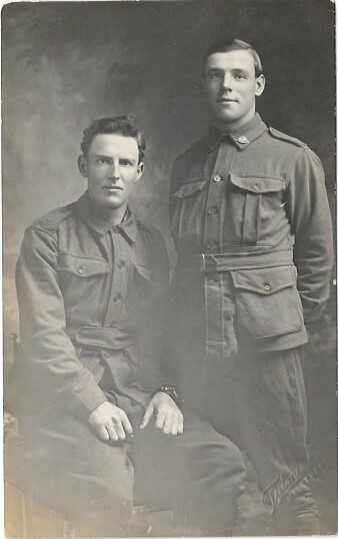 Photograph of Jack Whyte (left) and his brother Terry with the framed photographs of three World War I soldiers and a woolclassers NSW roll of honour. Picture: Kieren L Tilly. 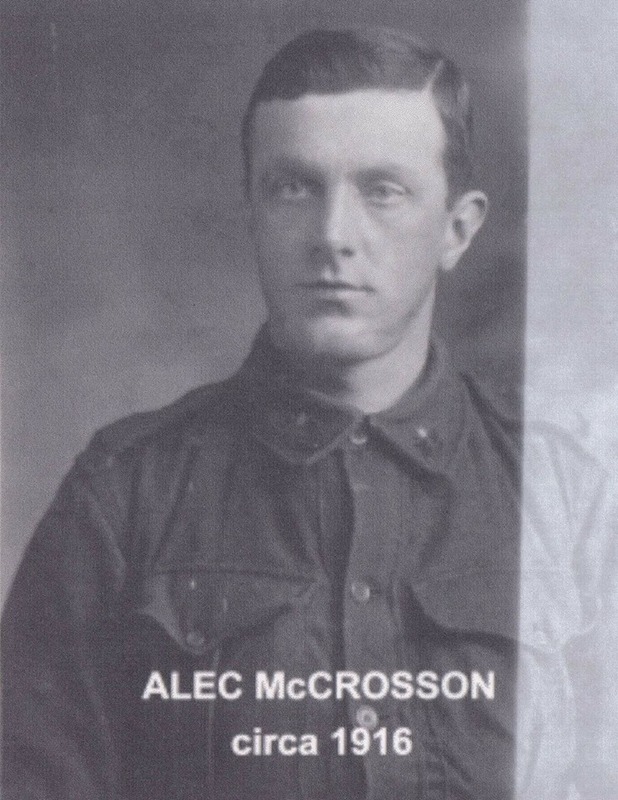 4168 Pte Alexander McCrosson, 10th Reinforcements / 22nd Battalion, born Glasgow, Scotland, wounded in action at Pozieres on 5th August 1916 and returned to Australia in February 1917. Photograph courtesy of Nick Bertram and family. 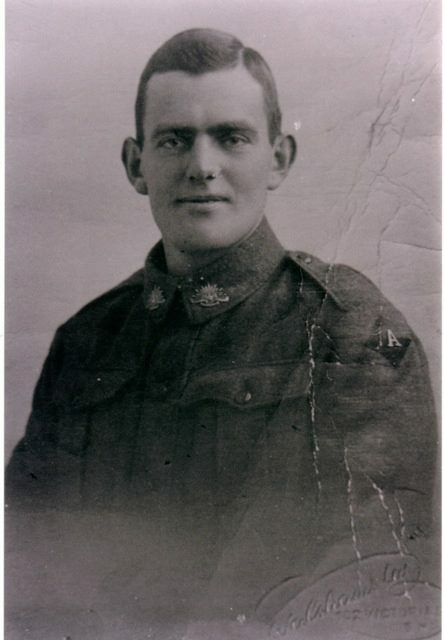 4711 Pte Hugh Glass, 12th Reinforcements / 22nd Battalion, born Flemington, Melbourne, died of wounds on 4th October 1917 during the Battle of Broodseinde. Visit the Lijssenthoek Military Cemetery website for more photographs and memorabilia of Pte Glass from both home and during his time in the AIF, collection courtesy of Ed Lowis and family. 5141 Pte John Joseph Mitchell, 13th Reinforcements / 22nd Battalion from Richmond was one of ten men killed in action on 18th September 1917 by a high explosive shell that hit the captured German block house in which they were sheltering. Pte Mitchell is buried in the same grave as 1090 Pte Twist who also died in the explosion and whose story is told in the commemorative video. Photograph courtesy of Joe Mitchell and family. 5795 Pte Andrew Miller Ferguson, 16th Reinforcements / 22nd Battalion, was born on 17 February 1889, son of John and Elizabeth (nee Miller) Ferguson at Port Germein. Prior to his enlistment he was working as a farmer; he enlisted on 23 May 1916 and returned to Australia in 1919. Photograph courtesy of State Library of South Australia (click on photograph for full image). 6367 Cpl Leslie Gordon Jeffreys, 18th Reinforcements / 22nd Battalion. Born in Sydney, and educated at Perth, West Australia. He was the son of the Rev. John Alfred and Jannie Jeffreys, of Clunes, Victoria. He was Staff S.M. in Rockhampton for four years. Was training Officer to Rockhampton Boys Grammar School. Was Training Officer at Enoggera, at the Officers School. Received an address from officers as a mark of good fellowship and appreciation on leaving camp at Enoggera to enlist. Has had eight years military service. 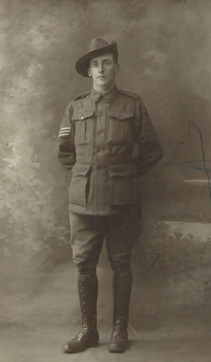 Enlisted in October, and went into camp in Melbourne on 13th November, at Royal Park Camp, 1916. Sailed for England late 1916, as Company S.M., and retained his rank until he went to France. Was rated as Corporal on the battle field, and was subsequently recommended for commission. Was killed on the battle field on 3rd October, 1917, by shell, and was buried at Tokol, France. Photograph digitised from ‘Queenslanders who fought in the Great War’, created by Owen Wildman. Brisbane : Besley and Pike. 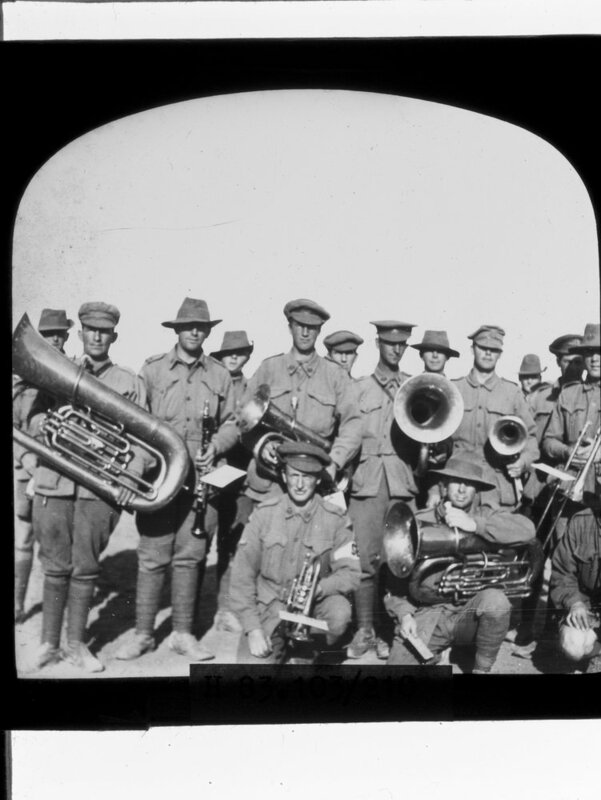 Members of the 22nd Battalion band, taken in 1915. Click on photograph to access via the State Library of Victoria. Photograph courtesy of R.P. Bennett. 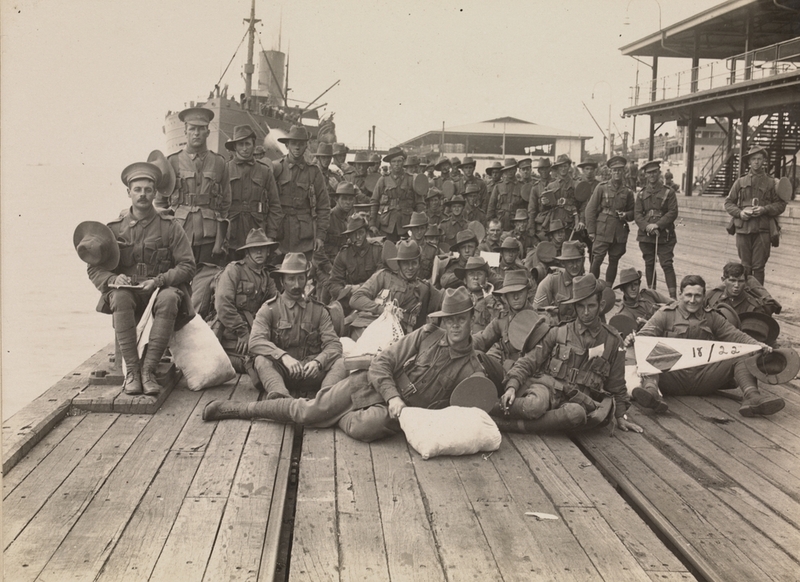 The 18th Reinforcements / 22nd Battalion waiting to embark on board the HMAT A20 Hororata on 23rd November 1916. Photograph courtesy of J.H.B. Armstrong. Group of officers and enlisted men of the 22nd Battalion (and others) gathered around a statue of Napolean Bonaparte outside the Palais-Royal, Paris in 1918. Note the statue has had slouch hat put on head. Photograph courtesy of R.P. Bennett. 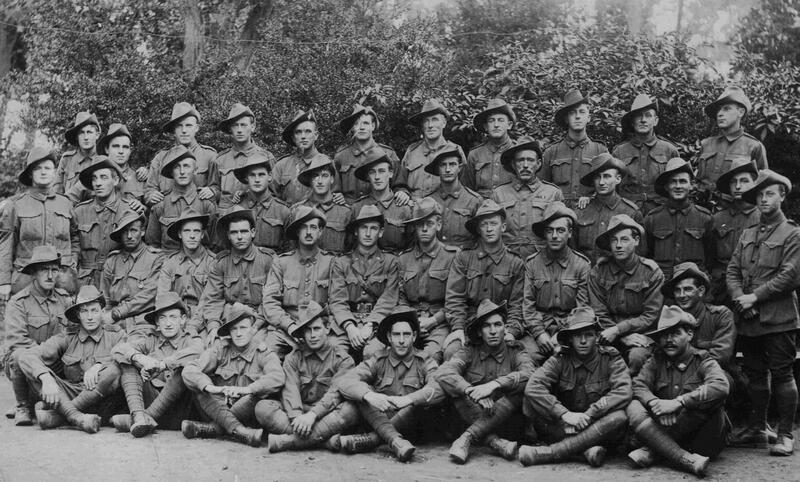 ‘D’ Company, 13th Training Battalion, Codford, May 1917 – After their transfer from Egypt and to the Western Front the AIF created Training Groups in England for the newly arrived reinforcements from Australia, on the basis of one group for each of the five divisions. 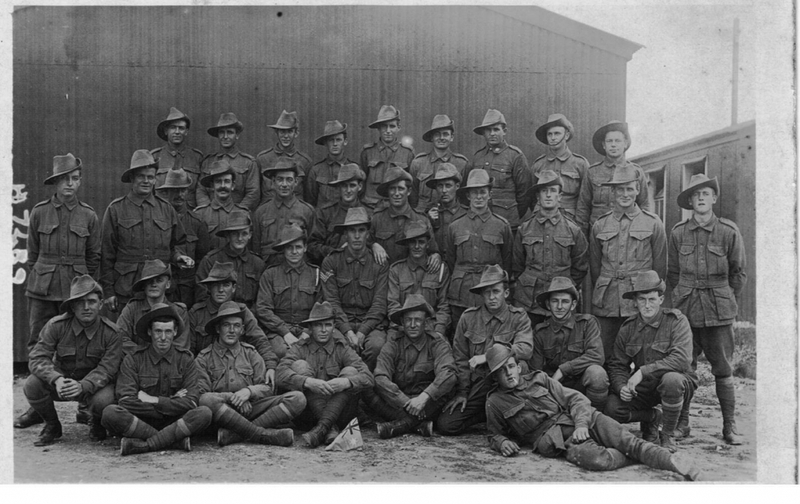 The AIF 4th Division comprised of the 4th, 12th and 13th Brigades, and it was thus the 13th Training Battalion that was responsible for training the reinforcements of the 13th Brigade. Therefore within the photograph it contains the men that would be joining either the 49th, 50th, 51st or 52nd Battalions within the 13th Brigade. 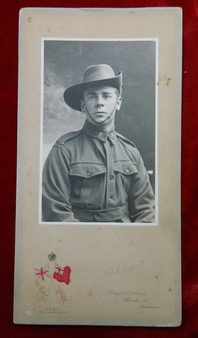 Photograph donated to the RSL, Western Australia. Soldiers of the 22nd Battalion relaxing on board the ship SS Chemnitz enroute home to Australia in August & September 1919. Click on the photograph to see a selection of pictures taken during the voyage and access via the State Library of Victoria. Photographs courtesy of Mrs A. Holloway and from Tracy Williams.